International network that link various networks throughout the world is called Internet. It can also be termed as the network of networks on global form. By using this global network structure we can integrate different network structure to form global network. Since Internet has become a major part of society and business sector so different institution should use this application as a major tools to integrate with supplier, customer and other business environment. Here are some major application areas of the Internet on business and service sector. It is applicable for advertisement of the institution using World Wide Web. It is used for communication between different users and institution using email, internet etc. It is used for Entertainment. We can browse different websites and communication system on internet for entertainment. It is used to distribute information to concerned people. It is applicable for online news publishing and processing. It is possible to recruit people using online job offer. It is applicable for research and development because we can download so many information related to research and research document. It is possible to promote online services and commerce called e-commerce. It is possible to give online support and advises to needy people. It is possible to attend online classes for online education and training. A web page (HTML file) is a plain text file that uses HTML code tags to instruct web browsers to display text and objects in specific ways. They can be prepared using any plain text editor (such as Notepad) or by using a visual editor such as Web Page. A website is a group of web pages that have information in various that contain similar subject materials. For instance, the web site would have a name (subject) such as GoodFords.com and have several pages related to good Ford vehicles. The website has a main web page commonly called the Homepage (index.html or default.html). The site's address will display the homepage and you can click on hyperlinks to go to other pages on the website. The standard set of rules and regulations that controls and defines the network structure is called the protocol. The internet structure is possible due to the protocol associated with the global network structure. Popular protocols are File Transfer Protocol (FTP), Transmission Control Protocol (TCP) and the Internet Protocol (IP). The world wide web (WWW) is a set of many thousands of computers that are connected to the internet and serving web pages. These computers are usually controlled by a hosting company but in some cases can also be a personal server or business server that has web server software running. Hyper Text Markup Language (html) is the computer programming language that defines the content, layout, links and graphics that when converted by a web browser creates the web page that we see on our screen. All HTML tags are enclosed in the < and > symbol.Usually, HTML, tags are used in pairs- an opening tag and a closing tag . These tags can also be called the start tag and the end tag. The closing tag looks just like opening tag except that has forward slash right after the first angle bracket. For example, the closing bold tag looks like this : , and the closing italics tag looks like this: . An Html file is a plain text file with either .htm or .html as file extension. The three letter extension (.htm) call back to a time when computers would only allow up to three letters in file extension. You can either use .htm or .html in file extensions. Text Editor like notepad to type the HTML codes. Web browser like internet explorer to view the web page. 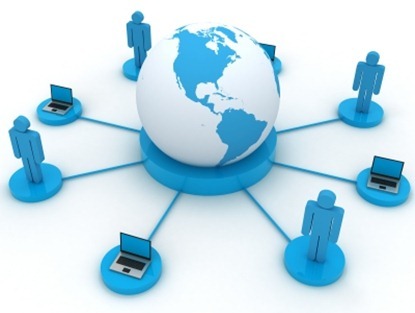 International network that link various networks throughout the world is called Internet. A web page (HTML file) is a plain text file that uses HTML code tags to instruct web browsers to display text and objects in specific ways. A website is a group of web pages that have information in various that contain similar subject materials. The standard set of rules and regulations that controls and defines the network structure is called the protocol. The world wide web (WWW) is a set of many thousands of computers that are connected to the internet and serving web pages. HTML stands Hyper Text Markup Language that is used to develop Web pages. It is a versatile language and can be used on any platform. It was developed by Tim Berners Lee in 1990. HTML documents have html or html file extensions. List any four advantages of HTML language? HTML is simple language to code and required little time for developing web page. It provides special tags that help text in the form of tables. It is designed to work on a wide variety of platform. It provides hyperlinks to connect different Web pages with another. What is HTML tag? List its types. A tag is coded HTML command that indicates how part of web page should be displayed. All HTML tags are contained with angle brackets (<>) e.g <Head> <Body>, etc. What is the difference between container tags and empty tags? The container tags are pair tags i.e. they required a starting tag as well as and ending tag. They affect the text appearing between their starting and ending tag. E.g. The empty just required a starting tag and no ending tag. They just carry out the job assigned to them. E.g. <br>, <Hr>, <img>, etc. Write the basic structure of HTML document. A document using http that resides on a website is known as web page. A group of related HTML documents and associated files, scripts and database that is served up by HTTP server on the www is called web site. What is a web browser? List any four popular web browsers. Web browser is software that allows users to view or browse websites on the www or in internet. Most popular web browsers are Microsoft Internet Explorer, Mozilla Firefox, Netscape, Navigator, and Opera. What are formatting tags? Give examples of any four formatting tags. Formatting tags are used to make attractive web page. These tags are called formatting tags. Formatting tags are used to format characters, words or a paragraph. Some common examples of formatting tags are <B>, <U>, <P>, <H1>, etc. Internet is world's largest computer network connected in a common protocol TCP/IP in order to make communication. It is also known as network of networks. What is the full form of WWW? The full form of HTML is ______. The standard set of rules and regulations that controls and defines the network structure is called _________. ___________ is a plain text file that uses HTML code tags to instruct web browsers to display text and objects in specific ways. What tag tells the browser where the page starts and stops? Any Questions on 'Internet, Terms, HTML and Its Introduction '?